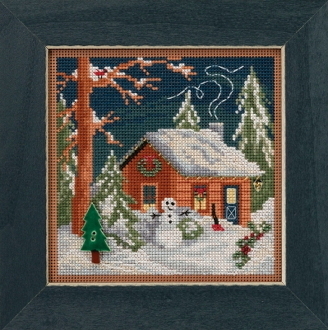 A beautiful Christmas counted cross stitch kit featuring a Cabin with a snowman outside, adorn with the included Mill Hill Pine Tree button. Design size: 5.25"w x 5.25"h (13.3cm x 13.3cm). Mill Hill Glass Beads, Mill Hill Ceramic Button, Mill Hill Painted Perforated Paper, floss, needles and chart with instructions.